There is a lot of information and quotes from top doctors on previous pages Even doctors who offer coolscculpting who admit that they offer a radio frequency treatment to clean up the loose skin lumps and bumps from the Coolsculpting. If you want to get it done faster with a side effect of smoother tighter skin use a radio frequency technology. We like and have experience with Exilis ( FDA approved for melting fat) We also use Thermage if its a small amount. 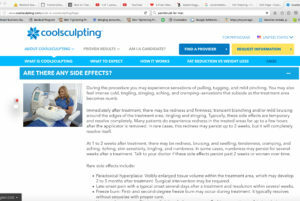 The TV show the doctors claimed 5 inches right off the table ( I think they werent measuring accurately a few inches is more the norm) But there are others Vanquish I think has promise, although I havent personally tested it I am sure its better than coolsculpting with all of its dangers and loose skin at best. Venus Freeze is another machine that I have considered but havent personally tested. The point is the last thing you need to do is Coolsculpting and risk needing surgery because your Coolsculpting treatment creates a condition that requires surgery to remedy. 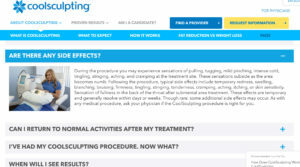 I saved a picture of the coolsculpting website last year and just recently. They actually took down the worst side effects from their FAQs and side effects list Ironically there are a lot of complaints about the very side effects they no longer list as side effects. Just have a look at real self reviews. And FYI here are the pictures of their website a year ago followed by today notice the last paragraph with the worst side effects was taken out. Simply google search any of those terms,, There are a number of websites inculding the National Institute of Health or the NIH that has a number of articles describing side effects that have occurred. Check out the post on real Self The woman describing Paradoxical Hyperplasia where the cells actually start rapidly increasing. Here is part of what she said “At this point the areas look 3 times bigger than they were before the treatment! My mid section increased by 3 inches! It was never ever this big. I am afraid I have a complication called ‘Paradoxical Adipose Hyperplasia’ (PAH) By the way this used to be mentioned on their website but they took it down. And of course you still have people complaining of pain many weeks later which is probably because the nerves were damaged by the treatment. It really doesnt make sense when you have radio frequency devices like Thermage and Exilis safely melting fat for over 15 years with the side effect of smoother tighter skin, Whereas with coolsculpting if everything goes perfectly you will have more loose skin and still need a Thermage or Exilis skin tightening treatment anyway. Why pay twice to accomplish a result you could achieve with just one procedure. Immediately after treatment, there may be redness and firmness; transient blanching (make white or pale by extracting color; bleach.. ) and/or mild bruising around the edges of the treatment area; tingling and stinging. Typically, these side effects are temporary and resolve completely. Many patients do experience redness in the treated areas for up to a few hours after the applicator is removed. In rare cases, this redness may persist up to 2 weeks, but it will completely resolve itself. Visibly enlarged tissue volume within the treatment area, which may develop 2 to 5 months after treatment. Surgical intervention may be required. Definition of hyperplasia: the enlargement of an organ or tissue caused by an increase in the reproduction rate of its cells, often as an initial stage in the development of cancer. 2. There is a tendency for uneven removal. It’s not skill-dependent, since a vacuum-like head suctions the skin in to freeze it, so there is a risk of uneven removal, says Paul Jarrod Frank, MD, a cosmetic dermatologist in New York City. 4. One treatment has been said to be enough, but that isn’t always the case. So in the end, it might not be the most cost-effective option to get the results you’re looking for. Be sure to talk to your doctor before going in for the treatment to see if you’re the perfect candidate for this procedure. 5. The procedure is for very discreet fat removal. Picture a thin man with love handles or a woman with small pockets of fat on her inner thighs. “Broader areas are not good for this treatment because that won’t come out evenly,” Dr. Frank adds. 6. There is literature that Paradoxical Adipose Hyperplasia (PAH) can occur after cryolipolysis. According to Dr. Frank and the National Center for Biotechnology Information, fat can grow back rather than disappearing forever. “Of course, there are risks with everything, but this is the only fat removal process that has this particular risk though low,” Frank adds. 7. It takes an hour to treat each section. So it could take a long time, depending on how many areas you want to treat. 8. You might experience cryolipolysis-induced numbness that can last for weeks. “It does something to the superficial nerves when the skin is frozen that can leave you without feeling for hours,” Dr. Frank says. 9. You can also have bruising. There’s minimal downtime with this treatment, but you might experience bruising since the areas treated will have been pulled, tugged, and pinched in the suction process. And you could be sore for days or weeks after the treatment. 10. Full results take weeks or months to show up. This depends on how well your body reacts to the treatment. You should expect to full results by the second or third month. 11. 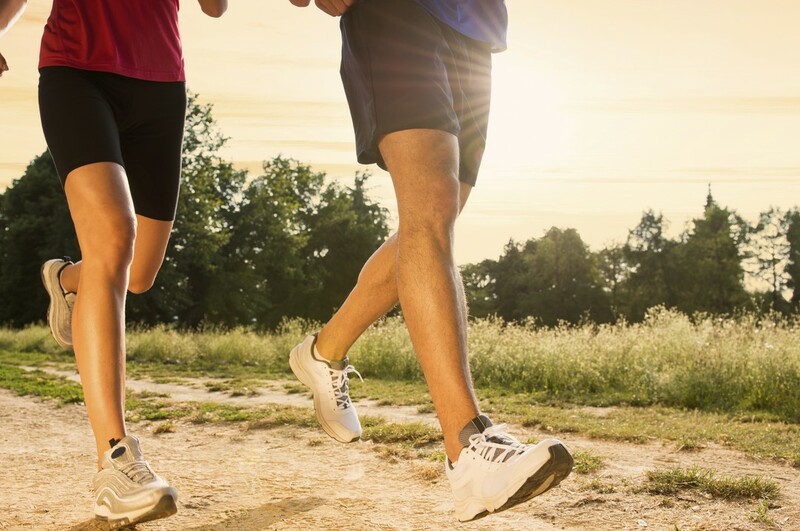 You need to maintain a healthy diet and exercise routine to keep the results. But you probably already knew that. Unfortunately as much as I would like to make this a simple discussion, if you dont understand the various technologies and how they work, you can not begin to understand why they would or wouldnt work on you. In the beginning around 15 years ago Thermage came out with a radio frequency device that is calibrated to affect the collagen layer. It is also used for some fat reduction as well. The treatment is specific to the collagen layer there is an immediate tightening and because the area has been affected, over three to six months there is additional contraction and smoothing of the skin because more collagen grows. The collagen is essential for smooth “undimpled” non saggy skin. The collagen holds back the fat and gets looser with age and hormonal changes. There is a great article in MedEsthetics a magazine for doctors that pretty much echos everything I am saying here. Dr Lisa Zdinak of Precision Aesthetics New York is quoted as well as some doctors who have Zeltiq, and they all admit that they use Thermage, Exilis or Acoustic Wave therapy after the Coolsculpting or Zeltiq treatment to address the lumpiness left over after the coolsculpting treatment. There lies the problem that I have. I dont know how doctors in good conscience can offer a procedure that creates a problem. Actually they probably never went to the large Aesthetic Shows in Europe and dont even know about better options. I have to assume they dont do any research or read the magazines. Or perhaps they dont care and its all about what the public is asking for. Dr. Street takes a slightly different approach. She notes that her patients typically see immediate tightening and then continued improvement over two to four months. “If they’re happy with the results, they will repeat the procedure in eight to nine months, with the final results lasting a few years,” she says. When performing treatments with the Exilis Elite, Dr. Zdinak has patients come in every two weeks for a total of four sessions, and then once every month for maintenance. “We see the biggest degree of change after the third treatment session, and we have had patients lose up to three inches in circumference,” she says. In 2014, Zeltiq added the CoolSmooth applicator to broaden the CoolSculpting device’s indications. The flat applicator is placed on the treatment area and does not need to “pinch” the fat, allowing the device to be used on areas that were previously difficult to treat, such as the inner and outer thighs, knees, and breasts of male patients with gynecomastia. To improve the results of his CoolSculpting treatments, Dr. Zachary mechanically massages the treated area with Zimmer’s ZWave device, which uses mechanical massage and high-energy radial shockwaves to disrupt fat, aid in lymphatic drainage and stimulate collagen production for skin tightening. John’s comment, Its a fact that it doesnt address skin tightening and after killing 20% of your fat you will have more loose skin and lumps. Some patients experience cramping or numbing following CoolSculpting treatments. …….“There is the rare patient—one in a hundred—that will get delayed, increased pain two or three weeks after the treatment,” says Dr. Mayoral. “It seems to last two to three days, and then it goes away on its own.” AGAIN A RELATIVELY NEW TREATMENT 4 years vs 14 years for thermage hopefully there is no nerve damage, or we dont discover any other side effects. Freeze or Melt your Fat ? ” limiting factors of cryolipolysis ( fat freezing for us normal people ) “is only useful in areas where the fat will fit into predetermined sizes, so there is no way to really feather around,” he said. “You are simply taking a lump of fat, freezing it and ending up with a 20% reduction. Also, the apoptosis rate for cryolipolysis is three months versus a reduction in nine to ten days with Exilis. Thus treatment is much faster when you heat fat as opposed to cooling it.” Likewise, cryolipolysis does not tighten skin. “If you are dealing with skin flaccidity ( loose skin) over a lipodystrophic area, you are much better off treating all the layers with heat and creating some injury to the dermis and fat, and getting the skin to compensatorily tighten and take up the slack where the fat was,” Dr. Salzman commented. On the other hand, reportedly, one problem with focused ultrasound ( yet another procedure) can be associated pain. So for those of us who dont speak doctor he is saying that coolsculpting takes months vs days for Exilis ( those are the two he is comparing) He also mentions ultrasound in the last sentence, since there are also new machines that work with ultrasound. He also says that if you use heat the skin will get “injured” so your body will tighten up and create new collagen offering you smoother tighter skin. (PS we also dont like explaining in detail the process whereby the body creates new collagen. But I am sharing with you because I believe most people are intelligent enough that if you give them the facts they will understand and decide. Not sure why they even posted this. Is this the one in a million best result after many months ? Clearly not the best alternative or procedure for a variety of reasons. People want fast results. Exilis or Thermage clearly wins in that category. The TV Show The Doctors reported 5 inches right off the table. I think thats a lot, they may have pulled the tape too tight we regularly get a few inches after the one hour treatement. Exilis is next results in 10 days according to research. Our patients report seeing a really nice difference after the 3 or 4th treatment ( we do 6 for the body, Coolsculpting you see nothing for around 3 months, then as they admit you see what chunk of fat you have killed and go back in to do some more. Safety time on market, Thermage wins with over 14 years, next comes Exilis with around 9 years, lastly we are still learning about coolsculpting which is really just a few years now. People dont lose weight so we have to assume the fat redeposits some place else. We also hope that the people who experience and complain about lasting pain do not have nerve injury. Time will tell. Also one coolsculpting treatment can take from 2 to four hours vs 20 minutes for Exilis and one hour for Thermage. It is way more painful than Exilis which feels like a warm stone massage although Thermage is painful. In fact considering number of treatments and cost its not cost effective for the patient. It is the treatment for the low information patient who doesnt want to spend 5 minutes researching before they give away thousands of dollars, and also the treatment of choice for those who respond to advertising and assume that the one who advertises the most is the best. Nothing could be further from the truth. Thermage is the favorite of Hollywood and celebrities like Gwynth Paltrow, Demi Moore, Jennifer Aniston to name a few that admit to loving the procedure. So Thermage doesnt have to advertise. And as I said if you dig even deeper you will see where Exilis is better than Thermage. But hey thank god advertising works if not our whole economy would be in trouble. Coolsculpting knows that if they spend 45 million advertising they will create another billion in treatments and sell thousands of machines. All is well until the public actually understands there are other non surgical options and actually do the research and use their common sense and trust their intuition to choose the best one. I was just speaking to a prospective new patient today ( thats what I do) She said it makes no sense to do a treatment that doesnt affect the skin at all. She figured that out on her own. I also have spoken to many new patients who have told me that they have friends who did Coolsculpting who come out lumpy and they were therefore not even considering it as an option. So we shall see how it goes for the next few years until the knowledge is more public. I am doing my part. By the way this would not be the first hyped system that falls away in the market place. We have tested many machines that did not live up to the hype or were not as good as ones we already have. My guess is that as long as there are “results” and a lot of advertising it will probably be around for a while. For some reason people more easily relate to apoptosis ( killing fat cells) via freezing vs melting, I have no idea why, but I would guess its advertising. The Holy Grail today is to get rid of our fat, loose saggy skin, flab, cellulite and stretchmarks without dieting and exercise. Actually many who diet and exercise discover that due to their age or hormones even after they eliminate fat by natural means they are left with loose or flabby skin. But lets get to it. Whats up with coolsculpting ? They are spending 45 million dollars advertising this year. That dwarfs every other procedure combined. Its going to seem as American as apple pie because you will not be able to walk down the street without seeing a billboard. But what is it ? Does it work ? Is it the best procedure for my particular needs ? What are the side effects or potential negative outcomes ? Is it safe ? Is it proven ? I am going to try to address it all to the best of my ability. I have been studying non invasive technologies for ten years, not just in the USA but in Europe. One of the largest medical conferences of the year is AMWC The Aesthetic & Anti-aging Medicine World Congress dubbed the The world’s largest event for Global Aging Management. It is 3 days of lectures on anti aging and aesthetic medicine. And it doesnt even take place in the United States. All the manufacturers are there from A to Z ( Allergan to Zeltiq) Hundreds of exhibitors. Just to give you an example of one that I am very familiar with BTL Industries. Means nothing to you but they developed Exilis one of the leading technologies in Europe for skin tightening and FDA approved for wrinkles and even non surgical fat reduction. The same company makes the Acoustic Wave that is the gold standard for cellulite in Europe. I say this because its a complicated world with hundreds of devices from dozens of countries. In fact what is even offered in the US is not necessarily the best procedure. You just need to understand the scope of the question, what is the best procedure for each condition.